Yep - I think I'd call it a Tissue Tape explosion with the amount of interest people seem to have in making their own version of a "Washi" tape. I'm no exception. 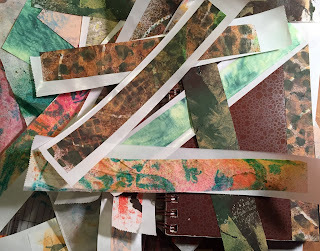 Ive been making then for awhile with scraps on my workshop table, strips of my monoprinted pages and even my Citrasolv™-washed National Geographic® pages. I've used book text and my own writing also. It's fun to make some to keep on hand, or to customize the tape with your current project's color scheme. Of course, having a few of the handy Xyron™ adhesive machines makes it even easier. I use repositionable adhesive on the strips I make to keep on hand. For targeted projects, I will use permanent adhesive. 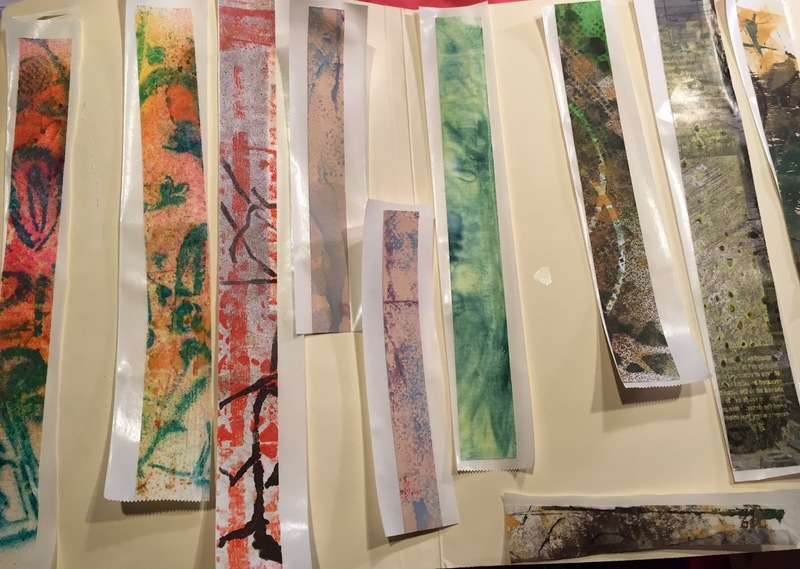 Recently, the Women's Bible Journaling group I lead spent some time learning how to do it for themselves. They can embellish their Bibles or notebooks with tape borders or specific words relating to the current study. We used strips from deli paper we wrote on as well as decorative napkins after removing the backing. I prefer keeping completed tapes on the adhesive backing sheet until I use them. Adhering them to the inside of file folders allows me to see my stash of tape. You better believe I have a basket of store-bought Washi tapes as well! Tips: thinner papers may wrinkle when running them through the machines....hold the paper as taut as you can without tearing it while adhering the adhesive. When you remove the top plastic, do so carefully so you don't lift the tissu. Also, be careful when you peel the tissue off of the backing because it will tear easily or double back on itself!